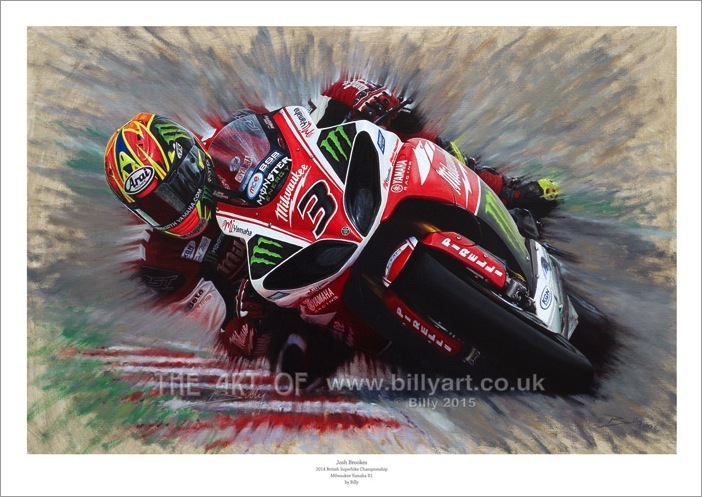 Josh Brookes limited edition giclée fine art print by Billy. This is a brand new limited edition fine art print of Josh Brookes riding the beautiful liveried Milwaukee Yamaha R1 superbike in the 2014 MCE British Superbike Championship. This limited edition of only 50 copies and 5 artist proofs of Josh is a giclée print on archival matte art paper using Ultrachrome K3 inks and each print is signed by Billy. 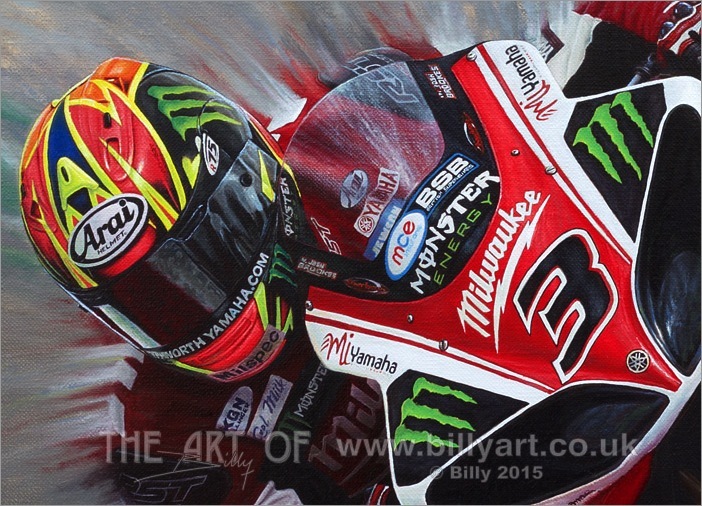 The giclée fine art prints of BSB racer Josh Brookes on the beautiful liveried MilWaukee Yamaha R1 Superbike are taken from Billy the artist's oil on linen canvas painting. 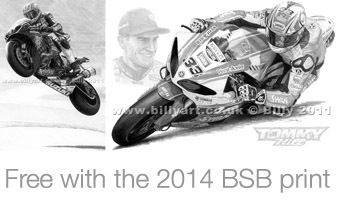 Each order will receive a free A4 pencil print of Josh leaping the Mountain at Cadwell Park on the Relentless Suzuki and former BSB champion Tommy Hill riding the SMR Swan Yamaha R1. Detail of the Josh Brookes painting below. This print has free UK post but I use 'Airsure' or 'International Signed For' for international orders so chose UK or international below to purchase the Josh Brookes fine art print. If an international buyer wishes to purchase more than one print then please contact Billy with your requirements and one invoice with one International shipping fee will be sent to you. This limited edition print of Josh Brookes 'King of the Mountain - Cadwell Park' riding the Relentless Suzuki by TAS in the 2011 MCE British Superbike Championship by Billy is art and not a photograph. 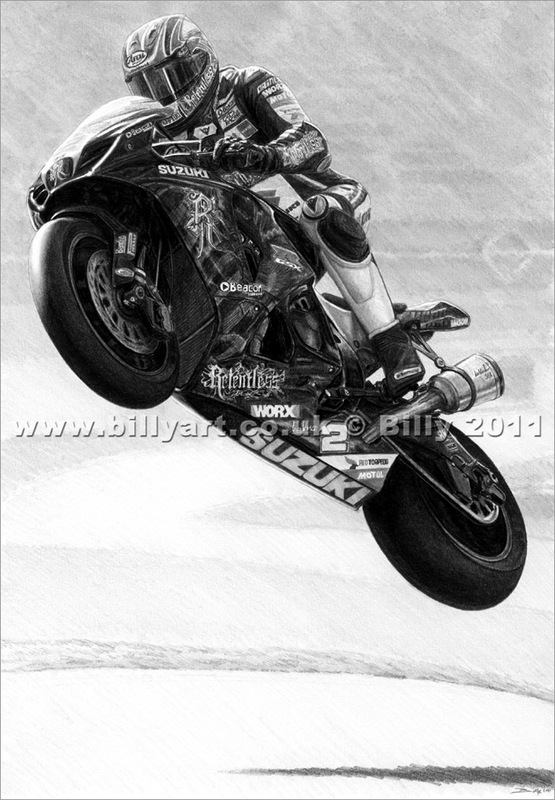 The drawing of Josh Brookes took Billy about a week to complete and shows Josh doing what he does best at Cadwell Park over the mountain section of the Cadwell circuit, getting lots of air, and would make a great addition to any Josh Brookes fan's collection. The Josh Brookes limited edition print riding the Relentless Suzuki by TAS is of 100 prints signed and numbered by Billy and has worldwide shipping included in the price.